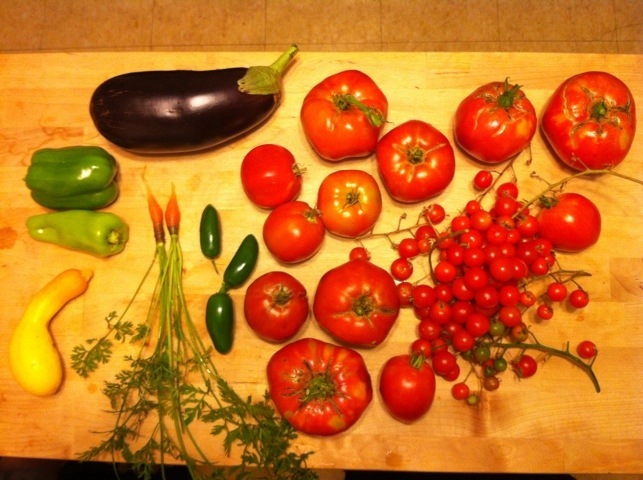 Check out today’s harvest! Sooooo many cherry tomatoes and two little tester carrots. Plus a giant eggplant?! Awesome! I wanted to get everything picked that was ready before the great Hurricane Irene comes in this weekend. With projected 70-125 mph winds coming in, I’m worried we’ll lose our garden. I would be so sad if this happened, but I’m going to try and cover everything with a tarp and just see what happens. I suppose that’s all we can do!